Why the polkadot dress? Ego and pride. Still I hadn't made the dress on the front of the Vogue Pattern package. 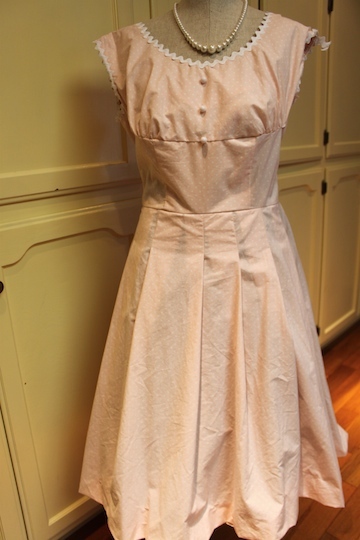 I wanted that dress and I was still determined to sew that dress, and get it right. As much fabric as I have collected over the years, I didn't have anything left that was close to 5 yards and the skirt pattern is quite wide, so i'm thinking sheets again. I loved the comfort of the first sheet dress. I found some pink polkadot queen sized sheets on sale for $30. I was hoping to get white polkadot on a color I liked. 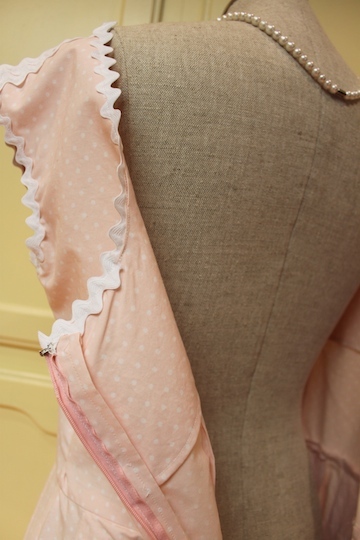 The closest I found were some pale pink colored sheets with white polkadots. They were pretty, but the polkadot was so faint and small it's hard to see them until your right on it. I was anxious, so I went with it. Again I found myself looking for a way around those buttons without loosing the look of the dress. As long as it looked like it had buttons I would be happy. 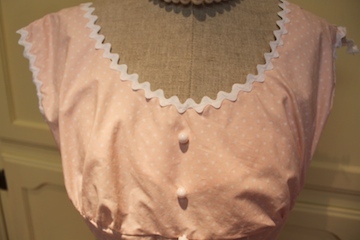 I thought I would do a zipper to eliminate the whole button, snap or bra hook idea. I'd done many zippers and felt more confident about that then the buttons,So this time I would leave the whole front of the upper section together, and cut the back for the zipper. 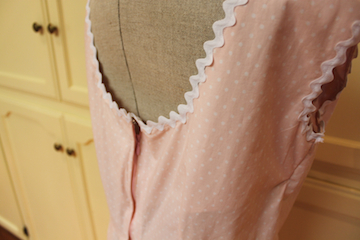 I prepared the fabric for the polkadot dress(washed, dried & Ironed), laid it out, pinned, marked, clipped and cut. The sewing went pretty well. I was getting quite conformable with this pattern. I was so sure this would be easier, and I could finish it in record time, that I tried to work past my patience point. It was at a critical point late one night, that I should have stopped and waited till I was fresh. But I was anxious to see it to it's end, and as a result, I didn't make good judgements in the final fitting. I took it in in the wrong places and ended up tightening it across the chest to the point of no return. I also discovered that the zipper was broken from about an inch from the top. Yes I should of checked it. What was I thinking. My new polkadot dress was not looking very promising. Check the zipper before sewing it in, and don't sew when you tired or burned out. Also I really compromised with the selection of fabric, or in this case sheets.I was raring to go and picked something that I didn't just love. If I don't love it, it's harder to work past the obstacles. The polkadot dress is not wearable at this point. It's got the zipper problem, and unless I have breast reduction surgery or do a lot of seem ripping, I won't be wearing this dress. Don't know what I will do with it at this point. Maybe make the skirt a stand alone item. There's a lot of fabric there, so I will make use of it somehow.